James Burbage built the 'Theatre' in 1576 on land leased from Giles Allen a staunch puritan, Giles was not in favour of any theatrical activities on the site but this did not stop James Burbage from building his 'Theatre' on the site. When, in 1597, the lease finally expired Giles refused to renew the lease. A clause in their former lease allowed them to dismantle the building. And as their ability to use Blackfriars as a playhouse had been delayed due to protests by local residents, Richard and Cuthbert Burbage with their troupe and carpenters went to Theatre at night and demolished Theatre. They used the reclaimed timber in the construction of the Globe playhouse on Bankside, Southwark. 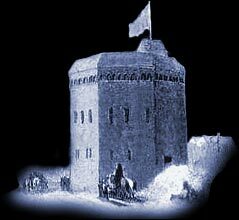 In the meantime the Chamberlain's men were forced to move to The Curtain, another public playing house near Theatre, until the building of the Globe had been completed.